into the play-off places on Saturday. With 0-0 written all over the game, Yeovil defender Ryan Dickson bagged his second goal in as many games in stoppage time at the end to break home hearts. With other games going Mansfield’s way Murray admitted it was a chance wasted and said: “I am utterly, utterly disappointed. I think that was a perfect smash and grab from them and their captain just came off and apologised. “To say we are gutted is an understatement. We have put ourselves in a position where if we are not going to be ruthless in the final third or make better decisions, you have to defend life or death to 94 minutes. “We had more than enough chances, but if you don’t take them you’re always liable to a sucker punch as we were today. “We have something like 12 or 13 efforts and they have to be goals, we’ve had glorious chances. That’s the way it goes. You can’t make decisions for people or play the game for them. He continued: “We do ever so well, but that final step is a bit too big. We just have to keep working hard – we can’t pull a rabbit out of a hat. We are what we are. We are doing what we can. “We never really felt under threat today and we got in their final third loads of times and had nothing at the end of it. Murray said anyone thinking Stags should beat a side like Yeovil in the relegation battle should think again. “The arrogance of it is that some people might feel all we had to do was turn up, as they are where they are in the league, and beat them. It doesn’t work like that,” he said. “They have only lost two in 11 or 12 because they are a good team, the new manager has done a great job. “Why should we beat them? We are Mansfield Town. We’re not Portsmouth. 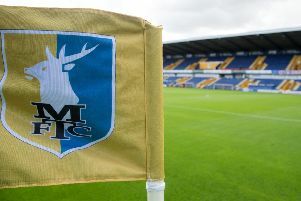 Murray admitted Stags had to take chances like today to get back into the top seven, as chances were fast running out. He said: “We are only going to get so many chances at this and there were a lot of draws today. “Win and we were back in the play-offs as other results went our way. “We have to do our job or we won’t get back up there. “It’s make or break time now – but we still do have an opportunity.